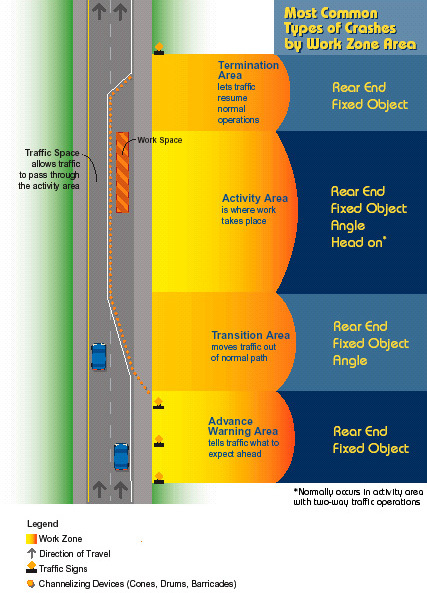 This brochure provides information to drivers on work zone safety. Remember these driving tips to avoid "A Sudden Change in Plans" and perhaps save a lifeincluding your own! Road work is just ahead. Be prepared for unusual driving conditions. Traffic is traveling in both directions on a roadway that is normally one way. Be alert for oncoming traffic. Traffic needs to follow this vehicle to get safely through the work zone. A lane is about to end, requiring you to merge into the adjacent lane. The "bent" lane shows which lane is ending. A flagger is ahead. Be prepared to stop and/or follow instructions. You will need to take an alternate route soon. You have reached the end of the work zone. Resume normal, safe driving. A driver in clear weather during mid-afternoon comes upon slow or stopped traffic due to a work zone and crashes into another vehicle, or in the process of avoiding such, crashes into a barrier, equipment or pedestrian.